New to the A2 syllabus last year was the Laffer Curve. PBS Economics correspondent Paul Solman explores the question of just how high U.S. tax rates should or shouldn’t be and examines the relationship between economic activity and tax rates. 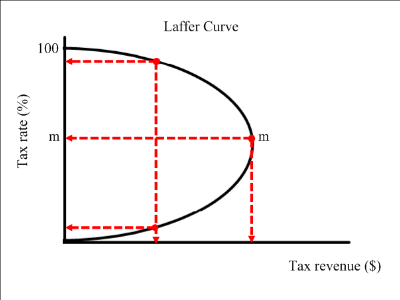 There is a good explanation of the Laffer Curve which is the relationship between economic activity and tax rates. In between, a smooth curve representing Laffer’s pretty simple idea: Somewhere above zero percent and below 100 percent, there is a tax rate where government will collect the most revenue in any given year. Now, the Laffer Curve applies to everyone, but the top so-called marginal rate is only relevant to the rich. It’s now 35 percent on all taxable income in excess of about $380,000 a year. Does that 35 percent rate maximize total tax revenue for the government? This entry was posted in Fiscal Policy, Growth and tagged Government Tax Revenue, Laffer Curve, Tax on May 24, 2017 by Mark. Do higher tax rates slow economic growth? 1. High taxes on the rich prolonged the Great Depression, but how do you explain the postwar boom when the top marginal rate remained in the 90s? And when Kennedy cut the top rate, growth was very subdued. 2. Reagan in the 1980’s cut the top rate of income tax from 50 percent to 28 percent with the hope that you will stimulate growth and trickle down from the top all the way to the bottom of the income distribution. Did it happen – NO! 3. When Clinton increased taxes in the 1990’s growth rose significantly which goes against what Arthur Laffer talked about in the previous post. So the relationship between growth and tax levels is complicated. This entry was posted in Fiscal Policy, Growth, Inequality and tagged Laffer Curve, Tax on January 27, 2012 by Mark.